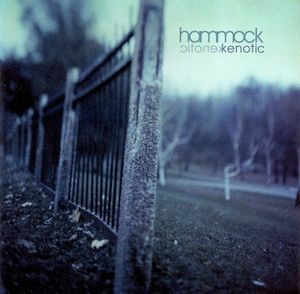 Nashville-based ambient duo Hammock appeared on the scene in 2005 with their album Kenotic, as the new project by former Christian rocker and CCM songwriter Marc Byrd, who has earned international fame for his song “God of Wonders,” a modern-day Gospel classic that is beloved worldwide and appears in hundreds of hymn books. Hammock was a different breed from that; in an interview I conducted with Byrd, he informed me that the song’s success gave him the ability to pursue Hammock in a way that would otherwise have been impossible to do. Though there’s no proselytizing going on, the connection is relevant; Hammock’s spacey, dreamy, deep melodies speak volumes about the concept of Heaven in a way no words could possibly capture. This was partially the point, according to Byrd; he wanted to create music that fit the lesser-known but technically correct definition of the word “awesome”: powerful, grand beautiful music that would inspire praise to God. And that’s exactly what Hammock did. Hammock’s arrival in 2005 is also noteworthy. That year marks roughly a generation since the birth of Ambient and post-punk, which in turn inspired shoegazing, all of which amalgamate to form a sound that is truly Hammock’s own. You can hear shades of early Brian Eno and Harold Budd combining with the guitar work of Vini Reilly and The Cocteau Twins’ Robin Guthrie, and on up through the work of Icelandic ambient-rock pioneers (and Hammock friends) Sigur Ros. That they can take direct inspiration from the past and make it palpable years and decades later without sounding appropriative only highlights their brilliance. Musically speaking, Kenotic is very much a debut album. Unlike later work, wherein they would dive deep into long, extended sonic explorations, the songs are generally shorter pieces, with the occasional stretching out into epic territory. Thus, Kenotic is best approached as a whole work, rather than an album of songs—a format they would master on later records Maybe You Will Sing For Us Tomorrow and Departure Songs. Besides, the duo crammed a lot of atmosphere into these songs, so that shorter numbers like “Overcast/Sorrow” and the title track feel much, much longer than their relatively short lengths. This expanded edition features six recordings from 2004; these are shorter numbers that lean more towards a rock element, and though lovely, they pale in comparison to Kenotic, which only goes to illustrate how much work went in to making Kenotic the record that you hear. In the scope of Hammock’s discography, Kenotic is auspicious; it’s a masterful work, a valiant effort from a new band with lofty goals. That they met those goals quickly and masterfully only makes the record more satisfying. If you’ve not yet been introduced to the world of Hammock, this reissue is an excellent place to begin. You won’t regret it.